You know those books where you want to quote it every other page? Maybe tweet a few sentences or put it in a Facebook status just so the entire world can see it and maybe share your excitement over the words? 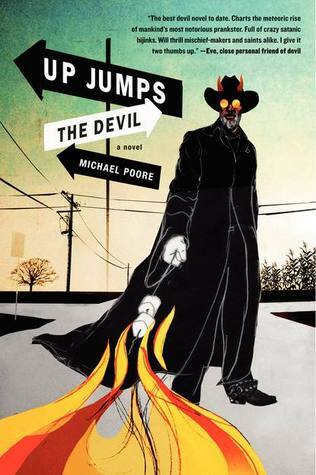 Up Jumps the Devil, Michael Poore‘s first novel, was one of those books for me. And when he played the guitar it was like strangling Creation because no one ever, EVER had the blues like the Devil had the blues, and even if they thought they had the blues anywhere near as bad, when the Devil finally burned to a stop, covered in sweat and tears and Spanish moss, they were way too scared to say so. I’ m a huge sucker for stories about the Devil. I want to see him as more than just horns and hellfire. Michael Poore’s Devil is a complex, funny, sweet, horrifying rebel angel and the world’s first broken heart. He wants mankind to be good and make Earth great so that his true love will come back from Heaven. His methods aren’t always nice. He can show mercy and he can be wrathful. He whispers into the ears of history’s great revolutionaries. He drives around in the JFK death limo and makes deals at crossroads. Up Jumps the Devil is his story. It jumps through time, from before the Earth existed to Egypt to Rome to colonial America to the 70s and right up into 2005. That’s the range, but it’s not chronological. The book also isn’t told entirely from the Devil’s point of view – we get loads of others in the mix, characters that are joyfully, painfully human and have the Devil in their lives. This organization could have been a mess and lost the reader, but I followed it with ease. This is the kind of book that you’re going to read and immediately throw at all of your friends, begging them to read it so that they can understand why cows make you laugh and why you’d happily go to hell if you could spend your time in the company of Poore’s Devil.